In the chaos of E3 day one we decided to abort our semi-tradition of a live stream video reaction to Nintendo's Digital Event, which was probably for the best considering the general online reaction. Having had a day to digest the results we've come into this video with the best possible intentions. We talk over many of the major reveals and answer a few questions, so check out out below! I like those puppets, but seeing them hurts because they're so representative of a really disappointing E3. That in turn makes it hurt more, because the puppets were supposed to be good fun, and as the rest of the event failed, so did they. Can E3 be over yet? I want more videos with the whole NLife gang! Can't wait to hear about Wooly World, Star Fox, and Mario Maker at next years E3! @uhhhhhhhh I think is how some of their IP are moving away from their traditional format. I usually don't question Nintendo but I can't help to do so after that "Metroid" display. No, you just sort of summed up our feelings. And considering the female operator was a straight-up Muppet, that's not a good sign in the slightest. I'm expecting a Direct before august, I don't know about you guys, but I'm calling it right now. Don't think I can sit thru another 35 minutes talking about the 51 minutes yesterday. I'm sure you guys (don't any women work here?) will be more entertaining when I'm in the mood. Nintendo Treehouse Event-Going good so far. The worse thing we had was hope. Despite poor sales, we've had a brilliant run of games that beats the PS4 and the XB1 combined, so we expected that to carry on. The journo's and commentators guessed Metroid U, Mario Galaxy 3, and a full Animal Crossing, and we've all added to speculation with our own theories. The digital event wasn't just 'oh well, not so good this time', but a statement that the Wii U was winding down. No longer could we sit on our high horses and brag about our superior enjoyment. Nintendo had borrowed this year's surprises for last years E3, and it seems there's very little left in the tank. And there were mysterious gaps in things that should exist. No MK8 3rd dlc, no new 3ds titles, no retro, no Bayonetta mini news, no Pokken, no 'more unannounced 3rd party reveals', no Splatoon update, no Zelda trailer, or even a few stills of a character or two. What they had was modest, but it could of been bolstered by some of these tidbits. People will still buy the big games revealed last year, but they need to keep our interest in brand Nintendo in 2016 and maybe beyond to the NX release, as the competition have a lot of things to sway our attention, and customers may not care to come back if they've already bought into something else. Expect an emergency reveal of something to hopefully keep us hanging on. Okay, the Digital Event was bad, because it was mostly filler. Developer Stories, the last five minutes, and wasting time with trailers that we already saw for Fire Emblem Fates, Xeboblade Chronicles X, and SMT x FE. If the Smash direct came 2 days later and replaced those three trailers, I'd say the Digital Even would have gotten a B-. Transformation as in they are focusing more on Amiibos than games for the Wii U and shifting development of games to the NX. I still think Nintendo will ignore the outcry and when MP FF doesn't sell well they will say " see we told you nobody would buy a Metroid or F-Zero game". They just don't listen and rely too much on Miyamoto, I am not buying Starfox Zero if you can't use non Gyro control. I would have been happy with F-Zero GX HD on Wii U with online multiplayer if we can't have a new instalment but no that's too much to ask even though the game just needs adapting. I won't be getting NX unless things change drastically and lets face it that ain't gonna happen! @Mona-Reggie Sums it up perfectly. @OneBagTravel You will hear a lot about the same PS4 games that you saw on this E3, since not a single game will release this year. So... where are those big third party partnerships they would announce? I'm guessing you all have English tea in those mugs: we have that a lot at our house too But overall, I changed my opinion from absolute hatred of Nintendo to appreciation of the effort. They are indeed transforming, which makes it hard for them to think in the present. They probably have an incredible launch line-up for the NX being created right now - and I can't blame them. They've learned their lesson this generation and will hopefully fix their mistakes. This was just awkward timing, that's all. @teoulas Activision Skylanders partnership? I'm not sure, they never specifically mentioned E3, they only said ''in the near future''. But you know, having something with ''E3'' in the title just before E3, makes for a way better clickbait article. @Octane fair enough, but Skylanders was already on the Wii U. I hope they actually announce new partnerships in the following weeks. I hope they announce some sort of discount on the NX if you turn your Wii U in... I believe our beloved home console is nearing it's last breath which will be Zelda. So we have a printer joke... Which is good. I wasn't really disappointed because I make sure not to get too excited about E3 in the first place. Some interesting stuff, maybe a little underwhelming, but there can't be megatons all the time, particularly if they're saving stuff for their next big move. Great video guys, makes me regret commenting a super negative comment on me... metr... Metroid Prime Federation Force . "Transformation as in they are focusing more on Amiibos than games for the Wii U"
The funny (or should I say sad) things is that because you (I mean, the people) buy all those Amiibo's, Iwata/the whole Nintendo crew goes sitting in a comfy chair with a cocktail NOT MAKING GAMES!!! 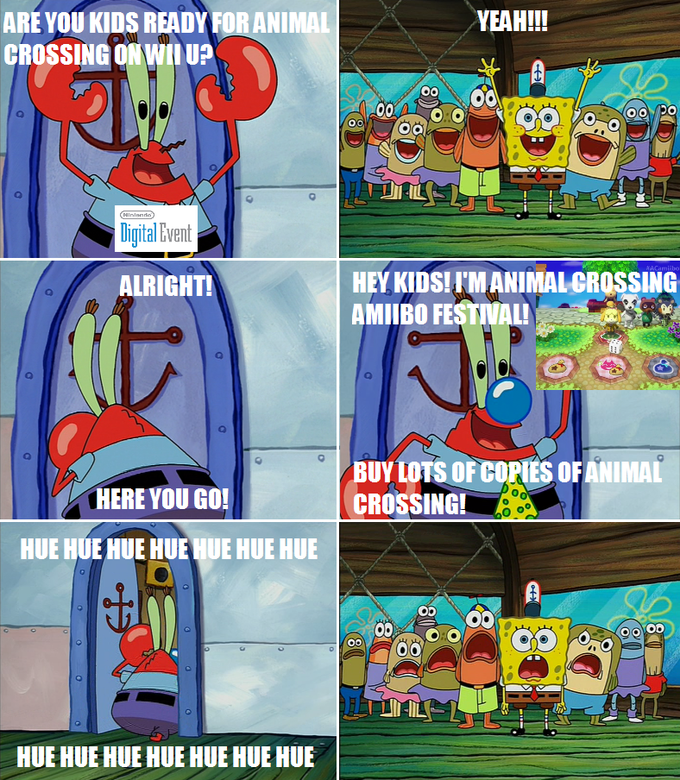 Nah, just release some more Amiibo's! It's allllllll good! That's why I don't buy Amiibo's. I like games. You know what? How often has this happened? How many E3's have Nintendo just turned up with no new reveals and only a handful of games scattered over a year. By my count its been quite a few. I think Nintendolife should keep on making more lengthy video content like this. Reggie doing push-ups was the highlight of the puppet segment. Well, it was a pretty bad E3, but it wasn't E3 2003 or 2008 or 2011 for that matter. At least Nintendo was fairly honest when it said it would only cover games coming out in the next 6 months or so. I'm sure we'll see a Direct sometime this or next year that will make us wonder why the hell E3 2015 wasn't like that. I don't think I'll play another video game ever again. Thanks Nintendo. @Jason723 The trailers were new. At least the ones for Fates and SMTxFE were, I'm not sure about Xenoblade but probably new also. I'd much sooner remove the developer stories than I would new sneak peeks at highly anticipated titles. This while e3 hasn't been that exciting. All the major reveals were leaked ahead of time and only a few games have me interested in seeing more. @MrGawain And you now this how? Again people, it's only one bad E3, not the end of the Wii U/Nintendo. The animal crossing board game thing is gunna be free but will require the amiibo to play, just saying. @Edgedino And so nobody will play it because, as we all know, amiibo don't exist. Nintendo just announced Kirby's Epic Tic-Tac-Toe and Super Mario Hangman Online. Wii U isnt dead! Thanks Nintendo! This year's e3 has proven Nintendo are irrelevant unfortunately. I think I realized what my biggest problem was with the event. It was seeing the amiibo lead in, and thinking we were getting an amiibo-centric game, and then having it be Skylanders. I also think not seeing games a year+ out coming for Wii u gives way too much credit to the "Nintendo is killing Wii u for the NX" crowd, which is disheartening. A price cut and some year+ direct info would do well for Nintendo now. @SavoirFaire price cut would work wonders or them i hope one comes so about a dozen o my friends will get it. I keep hearing how this E3 was the Wii U winding down, but in 2011 when the Wii was winding down all we had was Zelda. There are still plenty of great first party games coming, it's not going to be like the Wii's drought. I'm sure we'll get more games before the Wii U's swan song. @Chaoz Oh it's certainly the end of the Wii U. The games slated for it now are the last bunch. I'm sure there's some unannounced games left, but nothing too major. Pokken Tournament is probably the biggest one left. I knew it was a bad sign when I was watching the clock to see how much time Starfox was taking. I knew it! It went mostly downhill from there, with Animal Crossing and Metroid feeling like punches in the gut. @ValiantPixel This my hope, just awkward timing. But that opening line-up for the NX better be wham-bam spectacular. . .
@IceClimbers As I said before, and you know this how? Do you live under Iwata desk and listing to everything he say? @Samuel-Flutter Well.. not exactly. There's a big difference between a big AAA title and a few spin-off and party games. Nintendo only has Zelda on the Wii U for next year. @BlatantlyHeroic I don't see how Wooly World, Devil's Third, Xenoblade Chronicles X and StarFox Zero are considered spin offs or party games. And as for next year I'm going to remain an optimist and see what Nintendo will reveal during the next year. I suspect they didn't reveal a ton of new games this year, that couldn't come out before next E3, to prevent what everyone complained about this E3. The muppets were hilarious, I'll give them that. But seeing them now just makes me think of the slight disappointment. E3 had been pretty good. We'd had some pretty good showings from everybody in some way shape or form. So we were expecting Nintendo would follow suit. But it honestly felt like they were saying "hey, thanks for coming out.... we'll see you in 2016". I like your post. It is optimistic and yet also flips the pessimistic view on its head. As someone whos been with nintendo since the snes era I can honestly say I wont be blindly buying the next nintendo home console at launch and have genuinely lost faith in nintendo. I never thought I'd say that, there's been way to much bulls**t promises and outright lies at the end of the wii's cycle and into this one for me to blindly trust nintendo again going forward. Lucasartfilm/games + Marvel + Owned by Disney. @Tommy_Wiseau HA HA HA it can never be over. @uhhhhhhhh I think transition would have been more fitting. As for what is transforming, well, Nintendo is at large (QoL, DeNa/mobil, NX, amiibo etc. ), but more specifically, Nintendo's homeconsole is "transforming" into the NX, Club Nintendo is "transforming" into [something yet unnamed I think] and so we get one of those years between "generations", where it is too late for new big current-gen games, and too early for new next-gen games. Still, the release schedule is solid for the next 12 months, so I wouldn't worry about it too much. I have a feeling that next year will be very different indeed! I already have plenty of games that I still need to catch up on, this "soft" E3 is actually a good thing as it'll allow for more of that catch up time. @creative92 I'm with you on that. Considering gaming is just a hobby for me, I might actually have some time and money to catch up on the many games I've had to pass on in the past few years. It was a really tragic presentation for WiiU. I just say my opinion about this presentation. It was a waste of time for us and a waste of money for them. @thehoppypoppy Maybe NX is a true masterpiece but for me Nintendo is done. No respect for gamers at all. I have NES, Snes,N64,GameCube,Wii,WiiU.. well bye bye from an old fan. I was very disappointed in Nintendo's E3 this year, but even so I will not give up on the company. Nintendo has done numerous great things in the past and released some amazing and unforgettable games. I see this as just a rough patch that they are going through and will need as Reggie said, they are evolving and growing. Sometimes it takes a great downfall in order to re-emerge with something spectacular and hopefully Nintendo will figure out their direction, get their heads in the game, and blow our minds once again. I have much hope in Nintendo and I refuse to give up on the company I have loved all my childhood and will continue to love in my adult years. Other companies sell CGI footage and unplayable camera angles to players just to hype a game. Nintendo are selling that gaming experience with actual gameplay and the treehouse event really shows off interaction between people. It's refreshing. We got Star Fox and we got a localised Mother. Anything else for me was a bonus. Nintentendo showed off Yoshi and were really proud of what they had made. EA had Yarni and wheeled out a guy having a nervous breakdown that you felt sorry for to make your game. Sadly, the release of Earthbound Zero got me more pumped than any reveal in this presentation. So many platformers on wiiu and 3ds, I don't understand why they didn't talk about fatal frame and devil's third or just a little video to acknowledge them. And they talk about partnerships with third parties before e3 and for what ? A skylander amiibo.... I love nintendo but they were bad. This E3 made me want a ps4 but it's hard to defend the digital event even if I can't wait for xenoblade x, but there was nothing new and it's hard to argue with people saying that nintendo almost make the same games. Nintendo sticks to their roots. Complaining. Nintendo tries some new things. Complaining. No matter how bad their E3 showing was, XCX, Wooly World and Mario Maker are still coming out. Also, there's still at least a few more Nintendo Directs this year... don't lose hope! @mozie Never give up the faith. One of the worst E3's for a Nintendo fan. Thankfully I'm also a PC fanboy and will probably get a PS4 later on [with the money I save from not buying a NX], since at least those are doing good. I would just like to point out that '#' is not a hashtag, it is just a hash. Reggie has said that Iwata was misquoted, didn't apologise and that new Nintendo games are often met with confusion and then people gradually get excited. All I know is that during through the presentation I started wondering when would be a good time to buy a PS4. I don't remember that happening before. Same here. I used to buy Nintendo consoles at launch, almost on trust. But it took me months to buy a 3DS and a year for them to sell me a Wii U. I'll be holding off NX for a while to see how it goes. Between all those stupid statues (amiibos) and cell phone/digital only games, the industry is now pretty much dead. Nice job, Nintendo. The biggest issue Nintendo faced was bettering last years E3. Everything this year was just as good if not better than last year (although personally I've had enough of hearing about more Smash news), except for the main dish - the digital event. The puppets were great, but not as great as the chicken animation. The humour was good, but not as good as last years. The Puppets were not used enough. They re-treaded old ground - why did they focus so much on Yoshi when the game is due one week from now. There was three new Wii U reveals, which were lame, and the Starfox reveal didn't "wow". Whereas last year everyone was jumping up & down with excitement. The amount of 3DS reveals was good but not great. I do feel sorry for Next Level though. They don't deserve any of the abuse that they are getting; the Metroid game could be good and should be judged accordingly. I do understand the frustration of not getting a full-on console Metroid and using the Prime name was a bad error. The excuse that it takes too long to make a console Metroid game is pathetic...what if someone owns a Wii U and not a 3DS?? Still, with the exception of Bethesda none of the other events were that great. Sony's was slick and had Uncharted, which looked great, but half of it was dedicated to "buy our version of this game and you get full maps one month before the other versions"...Ohhh, how exciting---cough---sarcasim---cough. They padded it out with crap. UBIs was cheesy and cringe worthy with only multi-player games and Square-Enix, who did have some good games, was flat and dull. And EA, well it's EA...nuf said. After some time to digest and think on things, there's still 9 Wii U titles and 6 3DS titles coming out before end of year that I'm interested in, but with few announcements for post-2015 it does create an impression that both systems are winding down. The impression that the Wii U is winding down after 4 years and the new pralines were taken over to the NX let me feel a bit ripped of. Can't say that I won't by a NX but I have no thrust in Nintendo anymore. I also can't belive that a lot of 3rd paties will be there at launch of the NX after the Wii U experience. Maybe they will also wait and see. @Al_Godoy exactly what I'm thinking. Nintendo kinda just gave up on the Wii U and let down the people who bought one. Just as a reminder, Nintendo did say that for Wii U, E3 would only focus on games releasing in 2015. I would love a new Metroid but why the hell do so many people think it would sell well? Metroid never has. I didn't say it was the end of Nintendo. But it makes logical sense that if you have an exciting game that is coming in 2016 for the Wii U that is going to sell consoles, you show it, or at least do a Wooly World or Bayonetta 2 style announcement. And if there's nothing far along enough to show now, then it won't be ready for next year. With this I stick by my assumption. I really hope the NX is a true masterpiece and gives everyone what they want, but I'm guessing a lot of gamers who have only had a Wii U this gen up to now will buy another console to fill the void, and it's going to be really hard for Nintendo to lure them back with another Wii U style launch, minus the 3rd party support. Nintendo are the daddy of all console makers they should know better by now. The camera mans reaction during the event needs to be a gif. @EllenJMiller It's great to read this sort of response, which shows thoughtful, dispassionate reflection. I wish more Nintendo fans — and NintendoLife readers, frankly — were capable of it. Disappointment is understandable, but anger? That's right out, especially in a year as rich as this one has been and promises to be. The most exciting news out of E3 was the new DLC content for SSB. Obviously the announcement was spoiled ahead of time but having it released during E3 sure drummed up excitement. @Dr_Corndog No; you're spot on. The muppets were are great start, really genuinely funny imo, but then everything else just disappointed me and ultimately left me cold. What happened as a result is that I just came to think of the puppets as being a weak attempt at trying to distract me from the truth—Nintendo didn't really have many games to get genuinely excited about, and it felt like it was deliberately padding out its Direct with gimmicks like the puppetry, the dev talks and people singing the Mario theme. The puppets were cool but imo they would only really have truly worked if they were in addition to a crap load of genuinely exciting and impressive games and announcements—like the other companies both had—rather than being there instead of such things. Without the games and announcements to back them up, they kinda just felt patronising and slightly offensive—like Nintendo actually thought I wouldn't notice how sub-par it's lineup was if it blindsided me with silly humour and pulled at my nostalgia and heart strings with devs showing me early/original Mario sketches/concepts and lots of loving fans singing/playing the Mario music. I'm not that easily fooled or manipulated.